Yesterday I attempted to visit several different regions in Sacrarium. I attempted this while I was in OlympusGrid. 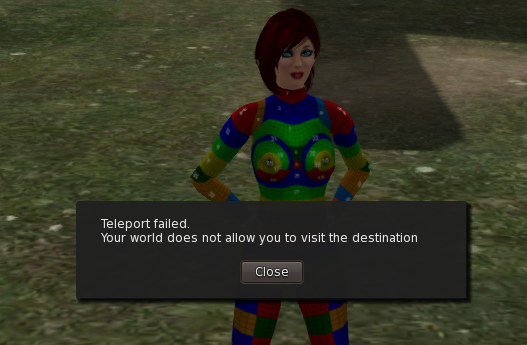 Today I tried to access a different region in Sacrarium from my region in Kitely and got "Your world does not allow you to visit the destination." Sacrarium, on the other hand, takes a very public anti-IP stance and knowingly distributes copybotted content. We therefore don't allow HG travel to or from that grid and our own, nor do we allow delivery of content from Kitely Market to that grid. While I have no intention of visiting Sacrarium, it does seem a pity that no compromise can be found that permits visits without facilitating flow of IP-restricted content. Before we enacted this policy we had people from Sacrarium try to run copybots to rip Kitely worlds and we had people from Kitely go to Sacrarium and bring back copybotted content that was ripped from other grids. This is the only grid which we've banned ourselves and IIRC there are only 2 other grids that have intentionally blocked access to Kitely users, in which case we've added a notification on our side as well so people will have a better idea why teleports to/from those couple of grids don't work. If there was a way to know which content is legally licensed then this ban may not have been required, but I'm not aware of any technology that can distinguish legally licensed from illegally copied content. I completely understand the need for it and have no suggestions for alternative actions to take to meet any obligations you may feel about protecting copyright or providing as much protection as you can for your clients/members. I'm just having to adjust my frame of reference from "open" to "a bigger walled garden." I understand that it's about my own perspective. I also understand that Kitely isn't the only grid that has blocked them, although it was all news to me until today. I didn't enjoy my trip over there, anyway. It was very laggy. I felt like I was on the mainland in SL. And the default avatar was generous but nearly 100k complexity, which makes my heart ache. The libertarian in me (not to be confused with party politics) cringes that I had to circumvent my home grid to learn that lesson, though. *shrug* I'm grown, I'll get over it. See paragraph 1 above. Where can I find out which grids have blocked Kitely users? I'd like to avoid unnecessary bounces in my future travels. I've checked and of the 3 grids that I know of, only Sacrarium is still active (the other two have apparently closed down). If you get this message in Kitely when trying to teleport to any other grid then you're probably using an outdated Grid URI for that grid. Please check that grid's website to find its updated Grid URI and let me know if using it also causes that error message to be displayed. I had a few issues with the guy of sacrarium, found several copy-botted items there and I'm very grateful to Ilan that he intervened as he did. First time it happened I I went over, found the items that people had warned me about, contacted the owner of the grid and he was nice enough to take it off. (well at least he said so if it really happened I unfortunately have not clue about). On top of that he was "nice" enough to ban me of the grid (since this was "grid policy", whatever that means in that grid). Some months again mentioned that copied stuff was over there and of same name avi on metropolis. Metropolis acted very correct, took the content down and banned the avi + IP of their grid. Also thanks for that. I do have to say that I was kind of wondered and reading the forum I'm not the only one that it was mentioned as being the most appreciated grid in hypergridbusiness (don't remember the exact terminology. A warning for what happens there would for sure be on its place. If the results we're not fixed by him or if people just seem to be happy that they can get a lot of stuff for free even is stolen we leave in the middle. Some people find that all has to be free in Opensim, OK their opinion but it takes a creator serious efforts and rl resources to do what they do. Not throwing a stone to you Soo, just mentioning my personal experience with them and presenting them for what they are. Which luckily is not the norm for many in Open Sim space.